House. Tree. Person opens up with us meeting the McGovern family - mother, Ali, father, Marco and teenage son, Angelo. The dynamics of their family are laid out for the reader from the view point of Ali. We learn of the family's recent downfall, and how they ended up on hard times, as well as some mysteries beginning to show - namely a breakdown Ali experienced some years earlier. Some of my favourite scenes within the story are from Ali's work at Howell Hall - I loved the connections she was able to form with the patients, especially moments between her & Sylvie + her & Julia. In general I found the characters within this book to be really well written, but the three of the (Ali, Sylvie and Julia) really stood out to me. For the first half of the book, I felt very confused at times but was also keen to know where all this was going, because trust me, at one point I had no idea! Part of this stems from Ali being the narrator, however she isn't the most reliable of narrators. I don't have a problem with unreliable narrators, but sometime they can make it a bit hard to truly get stuck into a story. The second half of the book was definitely the strongest, in my opinion, and the way the entire plot comes together is really well done. House. Tree. 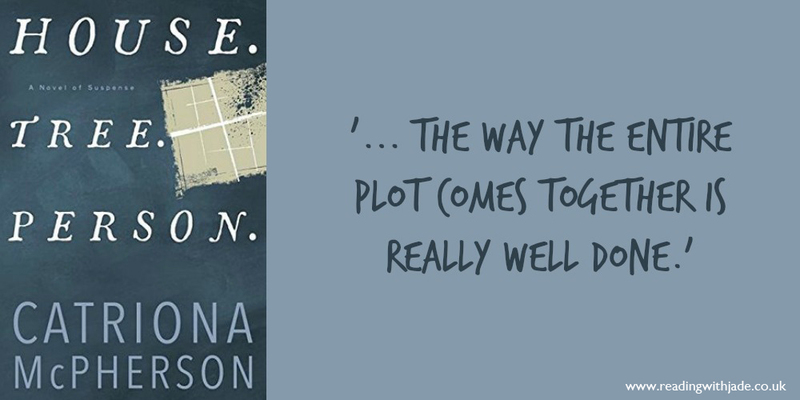 Person is a layered novel, with some strong characters, full of mystery & family secrets. Please note: a psychiatric unit is at the centre of House. Tree. Person., with mental health disorders featured throughout. House. Tree. Person. What an interesting title for a book. Your review leaves me very curious and still wondering where that title comes from. House. Tree. Person is a diagnostic test used within the health profession - quite a fitting title when you read the book (+ actually know what it is; I Googled the title beforehand and found out that way!). Wow! This sounds intense! I don't mind being a little confused in the first half as long as I'm assured it gets better! Your review and the blurb have me really curious to know what exactly is going on here! When you're looking for a mystery read, I'd recommend picking this one up!